Ocean Night is a monthly series of family-friendly talks held at the Sea View Theatre on the first Wendesday of each month. Every winter, SeaDoc hosts a series of monthly science talks on Orcas Island. This year, we’re putting an exciting spin on the series, which we’re calling Ocean Night—a free, family-friendly event at the Sea View Theatre on the first Wednesday of every month, starting at 7 p.m. 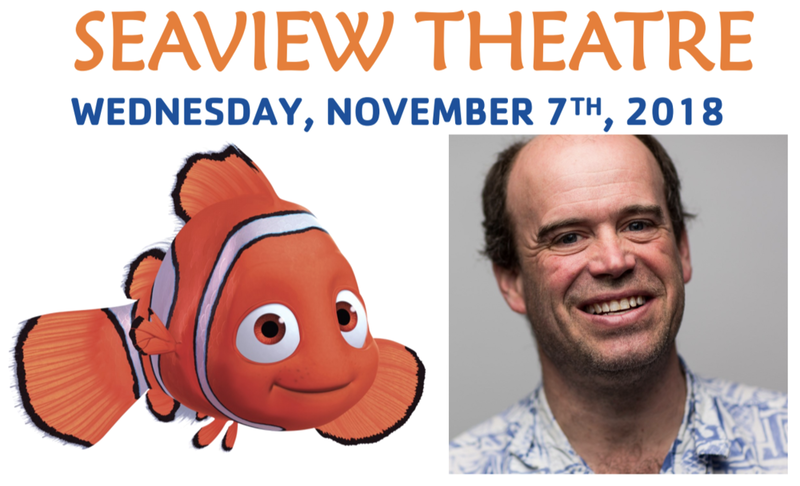 The debut event is this Wednesday, Nov. 7th and will feature Dr. Adam Summers of the University of Washington’s Friday Harbor Labs, who was also a science advisor on the Pixar films Finding Nemo and Finding Dory. His presentation is called “Fantastic Fishes: Fact, Fiction and Finding Nemo,” and in it he will break down the form, shape and movements of several species from the animated classic. Summers was approached by Pixar Studios in the early 2000s and spent three years advising the animators who brought Nemo’s underwater world to life. Summers will also explore some of the incredible fish that live right here in the Salish Sea. Video and multimedia will be a staple of all Ocean Night events, including this one, which will feature several clips from Nemo as well as slow-motion footage of real fish in action, with Summers guiding us on our underwater journey. Ocean Night is FREE and food and drinks will be available for purchase at the Sea View snack bar. Doors and concessions open at 6:30 p.m. and the talk starts at 7. Have questions? Call us at 360-376-3910. Adam Summers was raised in New York City and the north woods of Canada. At Swarthmore College he earned degrees in mathematics and engineering, but was not interested in pursuing either as a career. While teaching SCUBA in Australia on the Great Barrier Reef he met his first professional biologists. He returned home to get a masters degree in Biology at New York University and the University of Massachusetts for a Ph.D. From the beginning of his research career he attempted to capitalize on previous training as an engineer to understand the evolution of the mechanical systems of animals. At the University of California Berkeley he was a Miller Research Fellow working on the mechanics of salamander walking and the jaws of a particularly unusual group of limbless amphibians called caecilians. While at UCB he was approached by Pixar Studios to help them with the movie Finding Nemo. He spent three years advising on animal movements and biological aspects of the film and was delighted when the hard work of the Pixar folks was so well received at the box office. In 2001 he founded the Biomechanics Laboratory at the University of California and while there has won the Bartholmew Prize for physiology research and the Academic Senate prize for undergraduate teaching. In 2009 he moved his laboratory north to the University of Washington's Friday Harbor Laboratories where he assumed the role of Associate Director. With students and collaborators he has published more than 70 articles in scientific journals on abstruse subjects including the heads of hammerhead sharks, the properties of skeletons and difficulties of eating hard prey. He also enjoys sharing his enthusiasm for the field of biomechanics with a monthly column that appears in Natural History Magazine. The 60th column was published in 2008. Adam continues to teach an intensive graduate course in the biomechanics of fishes at FHL and he is also prospecting for new classes of biomaterials from the sea. A complete list of Adams publications is available here as well as his current CV in a variety of formats.